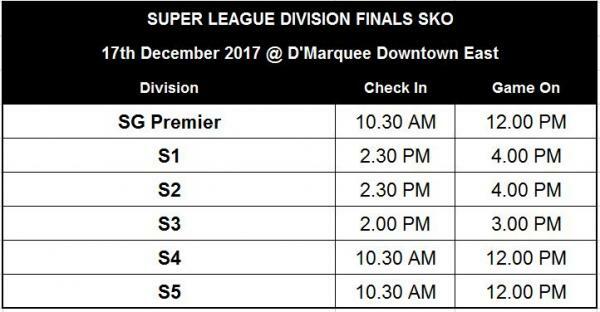 Congratulations to all the SUPER LEAGUE SEASON 14 & SG Premier SEASON 6 Group Champions and RR Playoff teams for making it to the LEAGUE FINALS on 17 December 2017! Listed are the timing for all the events happening. Please take note on the check-in time for your division and don't be late as walkover rule applies. All the best to all of you and see you at the top. Good darts! Please take note of the CHECK IN and GAME ON timings for the respective divisions! **Game format will be the same for SUPER LEAGUE SEASON 14 Division Finals and Plate Finals. It is going to be a fun and exciting day of LEAGUE FINALS. We have having lucky draw, fun games such as Xtreme Bull, Zero Stop etc. and our most anticipated event of this season BEST JERSEY! Please take note of all the special events timings! All the best and good darts to all teams! See you at D'Marquee @ Downtown East. Be there or be squared!